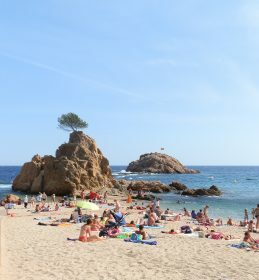 The two best known tourist towns on the Costa Brava are Lloret de Mar and Tossa de Mar - the first for its nightlife and the second for its panaroma and old walled town by the sea. The two towns are at the southern end of the Costa Brava and are much busier and livelier than the more genteel towns that further north in central Costa Brava. However, before we moved here, our first experience of walking in this area was travelling up by train from Barcelona to Blance on the local Barcelona train network (Rodalies) that runs up the Maresme coast. The first time we took the 70 minute train journey up to Blanes and then made a walk to Lloret, before returning to Blanes on one of the regular Dojijet passenger boats that run schedules up and down the coast calling in at the towns and beaches. The second time we also went by train but took the bus to Lloret from the train and then walked to Tossa, again before catching the boat back down the coast. If you're staying in Barcelona, both options are very practical ways of seeing the start of the Costa Brava by public transport for an adventure out of the city. However, despite the popularity of the towns for holiday makers, we don't go to the southern towns of the Costa Brava very often. We'd be more likely to go to Girona for shopping, or to keep to the beaches closer to home than make the trip to the more southern resorts. Today, however, our children have a visit to Lloret's Water World water park, to make use of the remaining 2x1 tickets they got as part of their day at Platja d'Aro's Aquadiver Park Water Park when their cousins came to visit (one ticket gives you access to both parks). So we're getting dropped off in Blanes for the walk while everyone else splashes about on the slides of Water World, then meeting up again in Tossa (about 21km) later in the day. 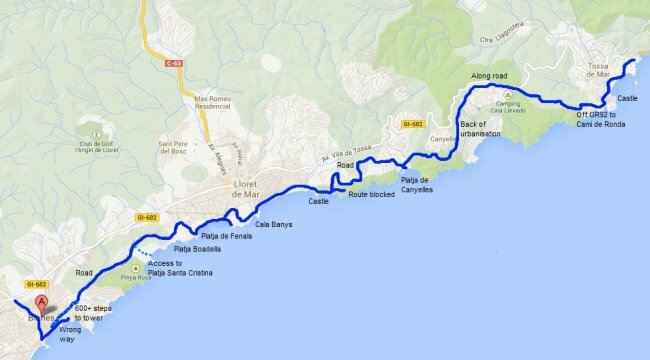 It means this is a linear walk rather than circular walk that we prefer, but as mentioned, the Dofijet boats run up and down the coast, so giving you the novelty of completing the loop by sea if you want to get back to the start point. The walk starts in Blanes which is officially the start of the Costa Brava as it's the first point where you come into the rocky headlands that distinguish the Costa Brava coast. To the south of Blanes is the Maresme coast, a long stretch of fairly featureless beach than runs all the way to Barcelona taking in the Maresme towns of Malgrat de Mar, Santa Susanna, Pineda de Mar and Calella de la Costa (different from Calella de Palafrugell), that are often mislabelled as Costa Brava by less scrupulous tour operators. In many ways Blanes resembles the Maresme towns more than those further north. Streets are laid out in blocks which gives the town a more industrial type feel and it's a town more orientated towards Catalan visitors than those from overseas. The ease of access from Barcelona means it is popular with locals, but it has far fewer non-Catalan tourists. Reaching the sea-front after passing through the town, we're greeted by a long broad Passeig Maritim full of restaurants and bars built for people who want to take an evening passeo, but in the morning it's quite quiet. The beach itself is very clean and looks as if it has been raked, but as the day is a little early and overcast there aren't too many sunbathers on the sand. The beach splits in two - a long sandy Maresme-type stretch to the south, then a rocky headland (Sa Palmora) - almost the marking stone for the Costa Brava and then the first proper Costa Brava type bay (Badia de Blanes) up to the port area. We walk along the Passeig Maritim to the port and then realise that we've missed the turning for the GR92. When we first did this walk, several years ago, we made the same mistake and had to negotiate the roads and estates above the town to get back on track. This time we double back but either we've missed the sign or the signposting isn't clear and we have to hunt to find the starting point, walking past the tiny church of Nostra Senyora de l'Esperanca before finding the connection at a loop at the back of Carrer Camadasa and then up a concrete stepped footpath at the back of the houses rising above the sea line. 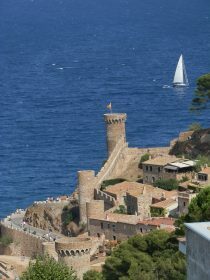 We're heading up to the tower of Castell de Sant Joan the highpoint above the town - and the ideal site for photos. The path between the houses runs out into a park-like area, and we run into the first proper flight of stairs. This part of the walk is almost all stairways. I only counted the steps on the upper third of the walk (250), so my guess is that this is a climb of 600-1000 steps to reach the tower at the top - so we reached the top sweating and with slightly aching knees. The view from tower at the top looks down across Blanes and its beaches and down along the Maresme coast across the mouth of the Todera river. To the north you can make out the villas and urbanisations around Lloret in the distance. The popularity of this area means there are large numbers of vast urbanisations such as Aguaviva Park scattered across the hills and down to the coast, each house straining for a distant sea view. We're not keen on urbanisations as they normally lack a centre and facilities and seem to be more a sprawling mass of holiday homes, either with dogs, or shut down in the winter. The GR92 continues past the tower and through the woods before reaching the road to Sant Cristina. The sea is to the right, but we're walking away from the coast on the ridgeway, with the area to the right firstly more of a gated urbanisation, and then subsequently the fenced off area for the Botanical gardens of Pinya de Rosa. It's a pity as it means we're walking on the road past houses and vilas when it would be much more rewarding to be closer to the sea, but without local knowledge and a long walk ahead of us we're not exploring to see if there are better alternatives. After the botanical gardens the next fenced off area is for the Hermitage of Santa Cristina with road access down to the beach of Treumal and Santa Cristina. Since we're aiming for a long walk we don't take the diversion down to the beach. If we were exploring more we'd look to see if there were other routes closer to the coast as the GR92 is proving a little disappointing at this point between Blanes and Lloret. Finally we find a route off the road and down towards the Platja de Boadella. We're in trees and can see the coast with the sandy unspoilt beach below us which looks as if it is popular with naturists. 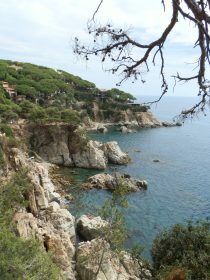 The GR92 now connects with the Jardins de Santa Clotilde at the outskirts of Lloret. The GR92 runs around the outside, but as we go past the other side, we realilse we could have gone through the gardens for a small fee. Just the other side of the gardens the GR92 is back on the road at Fenals, but we quickly dip back into the woods above Platja de Fenals - Lloret's second (and quieter) beach. 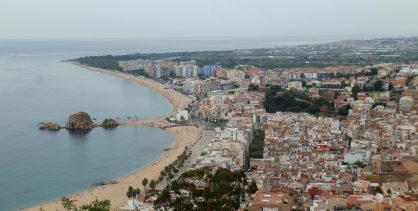 There's a headland over the beach with views back down the coast towards Blanes. We walk along the back of Fenals beach which is full of children and families. In the bay someone is parascending being towed by a speed boat. Around the other side of the bay it looks like the path should pass through a tunnel to the next headland, but the tunnel has been closed by a rock fall (probably from some time ago) so we have to double back and find the GR92 marked near the souvenir shops at the end of the beach. It would be easy just to follow the road directly to Lloret, but the GR92's red and white flashes actually take us to the back of a small park and up a flight of steps heading back to the sea. At the top we continue straight on to reach a watch-tower on the cliffs above the coast. This is another tower called Sant Joan and a twin to the one above Blanes. The path now takes steps down towards the sea through the rocks and through what seems to be the middle of a bar/restaurant down into the rock pools of Cala Banys - there's no beach here but lots of places to scramble. We also notice that it's starting to get busier with lots of tourists around and we can make out other languages including Russian (the Costa Brava is proving very popular with East Europeans). 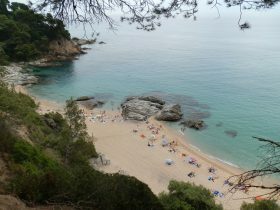 Around the headland from Cala Banys we get the first sight of Lloret's beach and the town itself. Lloret's main beach is long with a castle at the far end from where we're standing. There are lots of people on the beach and swimming and dotted along the beach front are numerous stalls offering water-based attractions like jetskiing, or boat trips. Around Lloret the hills are full of urbanisations with holiday villas and houses that can be seen from the rocky end of the beach. We're not here to visit the town, but Lloret is the busiest and liveliest town on the Costa Brava and very popular with young people from across Europe looking for bars and clubs. Outside the main season though, its actually still popular with Catalans and walking in winter we'd find retired Catalan folk enjoying the town. Instead we walk along the promenade at the top of the beach around to the castle. There are numerous bars, hotels and restaurants selling cheap food like burgers and pizzas, but the sea front buildings are only about 7-8 storeys high so it doesn't feel over-built in the way other package holiday towns like Benidorm can feel (though, as ever with Costa Brava towns, there is one over-sized edificio). With the people and the scenery it's not an unpleasant beach to walk along. 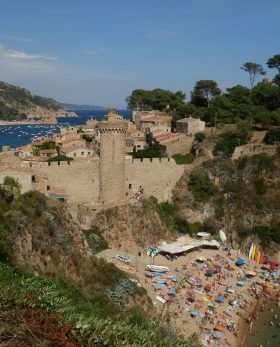 We reach the far end of the beach under the castle (Castell d'En Plaja) - a mock castle built in the 1930-40s. The beach at the far end is rocky again and a small islet just in the sea beyond the holidaymakers is full of cormorants enjoying the sea. The path curls around the base of the castle and round to the next bay. Suddenly Lloret is behind us and we're back to a more regular Costa Brava scene with a rocky bay and pebbly beach beneath us. We still have tourists around, though after another set of steps up, the tourist numbers drop off as we round to the next bay a small sandy beach of Cala Trons with a handful of holiday makers in the water. We try to continue on the path, but the route is closed for Cala Tortuga, so instead we have to double back and take the road through the urbanisation meeting the GR92 again as it returns to follow estate roads - so yet more tarmac. The sun has also come out so it's starting to get hot and dry - one of the challenges of walking in August - we've brought water but it's going fast. The path curves up and around the urbanisation and then down towards Canyelles past more villas with sea views and mature gardens. The road runs past the urbanisation centre - little more than a diving centre, an restaurant and an estate agent - urbanisations always seem to have minimal facilities and then turns down to the beach. The red-white flashes are easy to follow, and we turn left just before a tunnel and go right down to the sand. Platja de Canyelles has a small marina on one side and a sandy beach divided into one main beach and a couple of smaller coves. 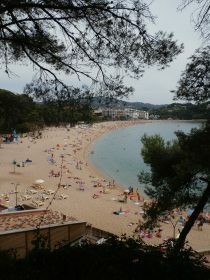 It's a very pretty beach, but relatively quiet, and would be somewhere to visit as an alternative when Lloret is too busy. We refill with water and I dip my hat in the shower to cool down as the day is now getting properly hot. The walk out from Canyelles is all up hill and still largely road and estate houses. Eventually the road turns into a track through the woods at the back of the next urbanisation. It's dusty and there's not that much to see. it would be nice to reach Cala Llorell - the next bay, but the GR92 skirts round the fences at the back of the estate and it's not clear if it's because the beach or urbanisation is private or because the geography prevents the path getting down to sea level again. Instead we're heading up and over the top of the urbanisation - the fence always to our right and little to see, and when we reach the top, the main Lloret-Tossa road in earshot (but not visible). We continue around the top of the estate and start to see the hills at the back of Tossa de Mar. The GR92 runs along the road for a while before turning off to the right along a ridge way through the woods towards Tossa. 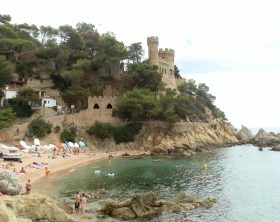 As we get closer to Tossa de Mar we decide to take the Cami de Ronda to the town rather than the GR92 as the GR92 runs through the back a little, while the Cami de Ronda runs around the cliffs and then down to the old walled town. Suddenly we can see the sea again from the tops of the cliffs and Tossa comes into view. Tossa itself is one of the most picturesque towns in the Costa Brava. The old town is walled and fortified - like Carcassonne by the sea - and stands above the sea on a peninsular with beaches on two sides. The modern town and beach sits below the castle walls and are full of good quality restaurants and hotels. 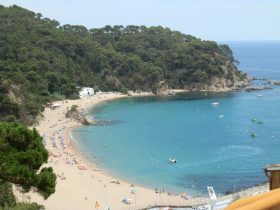 It's very popular, but whereas Lloret is more for younger people, Tossa feels more refined and middle aged. As we walk down the cliffs we see the first turrets of the fortified old town and the houses in the middle with boats in the bay in the background. Beneath us, people are swimming in the turquoise sea of Platja d'Es Codolar, clear enough to see to the bottom beneath them. We walk down and past the restaurants outside the old town walls.We'd visit more but we've been before and the walk has been tiring and we have a lift to meet. Though we've walked this before I think our expectations have changed from the first times we walked this way out of Barcelona. In all, it was a little disappointing - the GR92 is normally a reliable high quality interesting route. 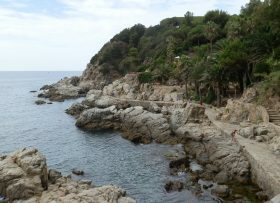 Perhaps surprisingly the coastal areas around Lloret were the best walking. Elsewhere there were simply too many fences and estates and just too much tarmac - probably about 70% of the walk was on the road. In particular the area to the south of Tossa is particularly frustrating and obviously on a longer distance walk we don't have time to explore so much. The next time we return we'd want to look for more local alternatives to the GR92 that take us closer to the sea - so shorter distances and not trying to link the towns.